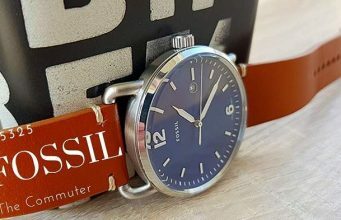 Fossil The Commuter watch – a close look. 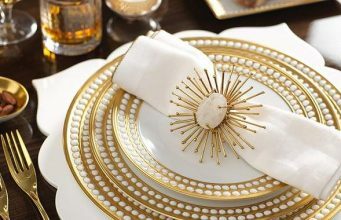 The Fossil Group is known for many things, as this highly established brand manufactures a great variety of products, including fashion accessories, jewelry pieces, clothing, designer fragrances, and watches. Today we’re taking a close look at the Fossil The Commuter FS5325 watch – a stylish and relatively affordable timepiece that offers an interesting mix of elegance and casual aesthetics. This is not a watch that I’d wear at fancy dinner parties or at important events, but I found it ideal for everyday wear, mainly because it is quite comfortable and decently accurate. 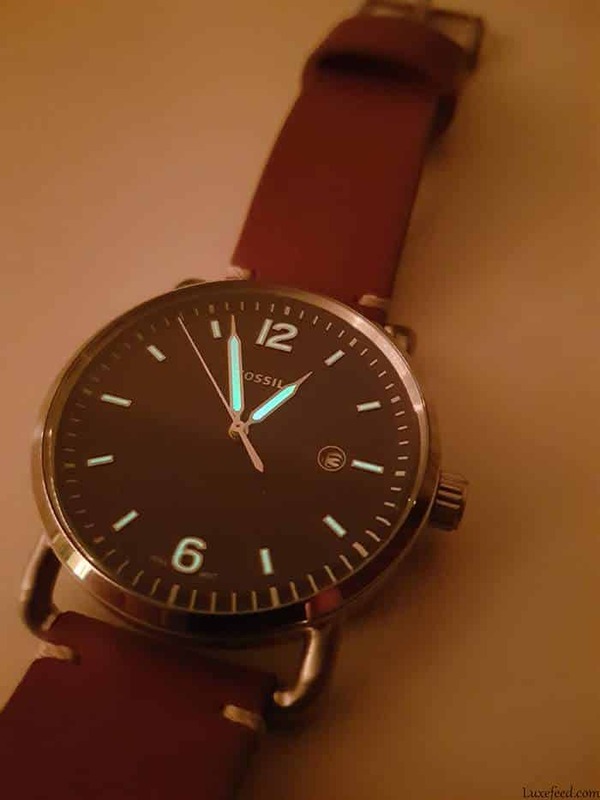 I put together this review in order to give you a closer look at The Commuter, just in case you’re thinking about buying this watch yourself. 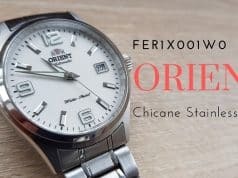 However, before I start examining the watch closely, I’ll tell you a bit about the brand’s history and what it stands for. Fossil was founded in 1984 under the Overseas Products International name. 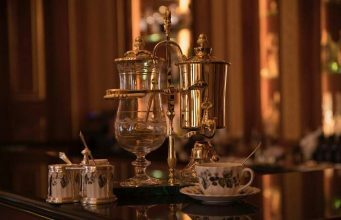 The original founder was Tom Kartsotis, who saw the advantages and the huge profits that could be made from importing moderately-priced fashion watches from the Far East. OPI’s main product line was fashion watches with retro aesthetics. However, in 1990, the brand introduced leather goods under the Fossil name, as well as launched the Relic line of watches. In December 2007, Fossil purchased Watch Station International from Luxottica. 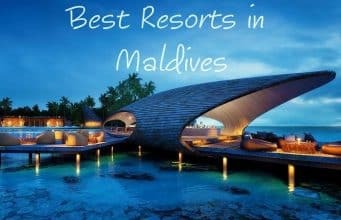 The company owns several design studios in Biel, Switzerland, just a stone’s throw away from Rolex, while its manufacturing facilities are located in China. According to the brand’s official website, The Commuter was designed to resemble a turn-of-the-century wristwatch. The model was introduced in 2017, and it still enjoys a great reception several years after its launch date. Fossil’s The Commuter is a medium-sized watch with a 42mm case, which means that it would look great on a small-to-medium wrist. I have a relatively small wrist myself, and I don’t think it looks too big by any measure. 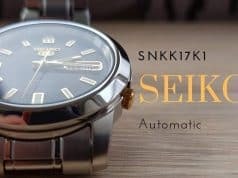 Compared to a 38mm watch such as the Seiko 5, it definitely looks bigger but it’s not necessarily heavier, mainly because it has a leather strap instead of a steel one. 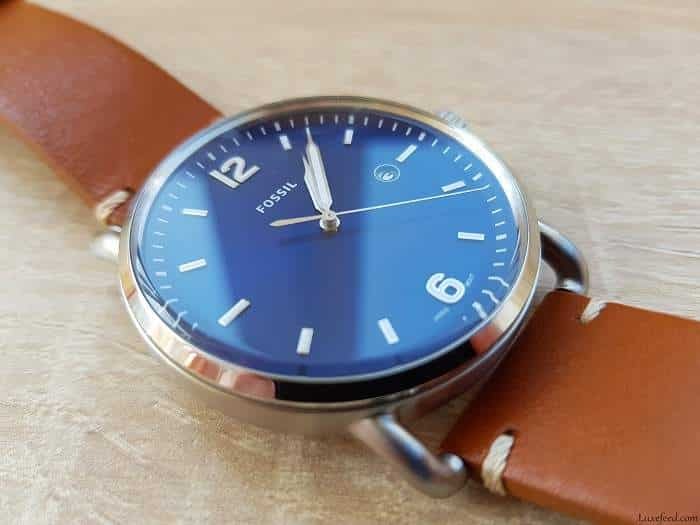 The case is made out of stainless steel, however, which is a nice touch, while the deep blue dial is probably one of The Commuter’s most eye-catching features. The bezel features a reflective metallic look but the case itself has more of a brushed steel/matte look. The case also offers a water resistance of 5ATM, which would translate to about 130 feet or 40 meters. Given the leather strap, I wouldn’t take this watch swimming, but light splashes or rain probably won’t do it too much harm. The dial is protected by a mineral crystal face, which seems to handle scratches pretty well so far. Some users have complained about the crystal being too brittle, but that hasn’t been my experience. It’s always a good idea to avoid bumping your watch into hard objects, and of course, some watch faces are more resilient to shocks than others. I will update this article accordingly as I wear the watch more, but so far, the crystal has held up nicely during everyday wear. The crown is located at the 3 o’clock mark, and it pulls out two times. The first pull is used to adjust the date for the date window, while the second controls the hour and minute hands. Some Fossil watches, such as The Minimalist FS5305, have slim cases that measure in at just 8mm in thickness. 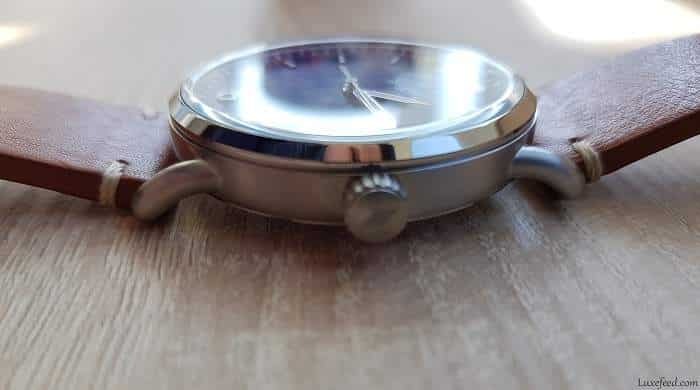 This enables the watch to take on a very minimalist and modern look, but the downside is that the crown is larger than the case itself, and it quickly ends up creating discomfort. Fossil The Commuter doesn’t have this problem because the case is 12mm thick and the crown doesn’t rest directly on the skin. The front part of the crown is adorned with Fossil’s own diamond logo for a touch of originality. The back of the case is also stainless steel, meaning that we don’t get to see any of the moving parts. However, since this is a quartz-based watch, that’s probably for the best. The case back shares the same reflective qualities as the bezel, and it does come with a few engravings that boast of the “all stainless steel” construction, the water resistance rating of 5ATM, and the official watch model – FS5325. There’s also a FOSSIL engraving, as well as a small box with the number 22 in it, likely indicating the strap width. As I mentioned before, the dial is quite eye-catching and beautiful, at least to my eyes. It has a deep blue colorway that takes on a more navy blue look in low light. As for legibility, it’s incredibly easy to tell the time at a glance, as the silvery hour markers and hands form a nice contrast against the blue. The same can be said in low light conditions, as Fossil has given the hands and markers a luminescent treatment. At 12 and 6 o’clock, the brand has decided to go with Arab numerals. The rest of the hour markers take on a simple rectangular appearance, and there’s nothing wrong with that in my book. Individual minutes are also represented on the outer edge of the dial for improved readability. There’s a simple Fossil badge under the twelve mark, while the six-hour marker is flanked by small “Japan” and “Movt” badges indicating the Japanese Quartz movement within. Let’s talk about the date window for a bit now, shall we? It’s definitely a nice feature to have, don’t get me wrong, but I wish Fossil would have made it slightly larger. Sometimes, the numbers get cut out slightly, especially when viewed at an angle, but this is not a deal breaker in my opinion. 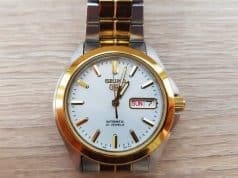 As I mentioned before, the FS5325 watch by Fossil relies on a relatively simple quartz Japanese movement. The brand’s official website states that this movement is more accurate when compared to a mechanical one, but this all just sounds like marketing to me. The description further states that this is an electronic movement with a quartz crystal that oscillates when a current is applied to it. As far as I know, that’s pretty much how all quartz movements work, but it’s never a bad idea to educate your customers, right? 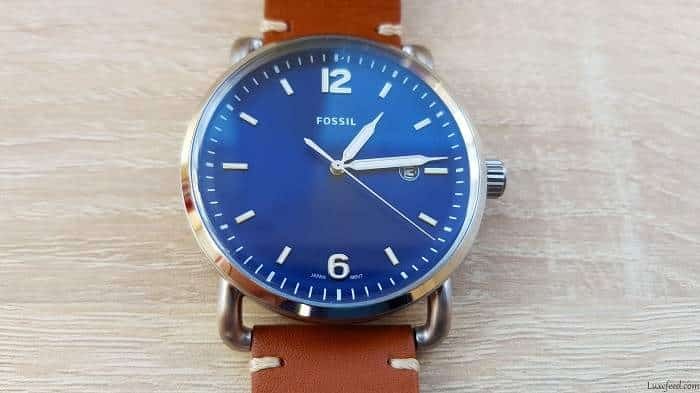 The movement needs a lithium ion battery in order to work, and fortunately, Fossil has decided to include one in the package. My watch was already working out of the box, which means I didn’t get a chance to remove any plastic strip that would prevent the battery from being drained before purchase. Generally speaking, these batteries last for a very long time, but I still wish I would have been able to start the watch myself. As far as accuracy is concerned, I have no complaints so far. The watch keeps time perfectly, and that’s all I can ask for at this price point. Fossil The Commuter comes with a brown genuine leather strap, which measures in at 22mm in thickness. 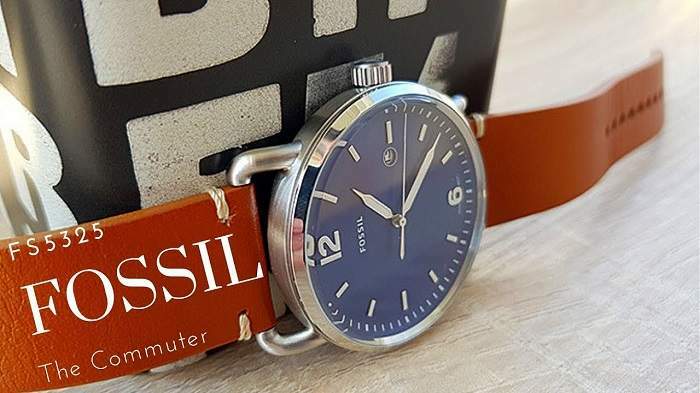 The official Fossil website does have extra straps on offer for about $30 each, and while the overall quality of the strap is not necessarily disappointing, I would definitely buy an extra strap to have as a spare given the chance. Furthermore, differently colored straps can add a bit of variety, especially if you plan on wearing this watch with different outfits. The strap has a simple pull-and-release mechanism on both ends, which means that replacing it should be a walk in the park anyway. The ends also feature some small stitching details that don’t look out of place while contributing to the overall casual look of the watch. 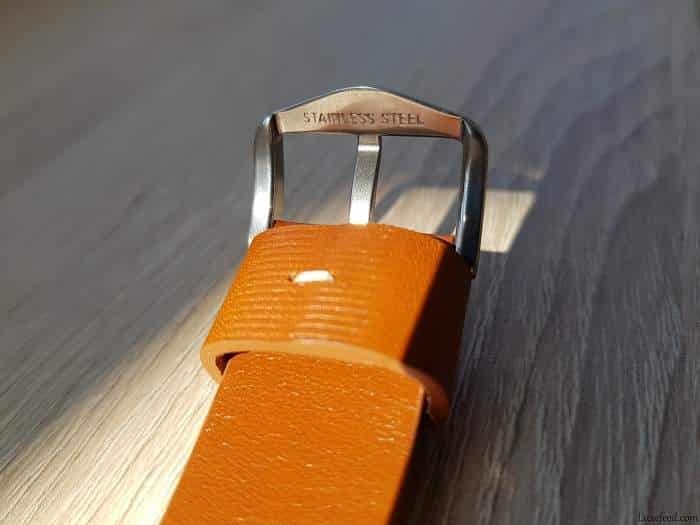 The buckle is also made out of stainless steel, its front comes with a Fossil engraving, while the back has “Stainless Steel” engraved. Comfort-wise, I have no complaints. The strap is a bit stiff right now as the watch is new, but it will likely give in a bit more over time. I’ll let you know how it holds up after a good few months of use. 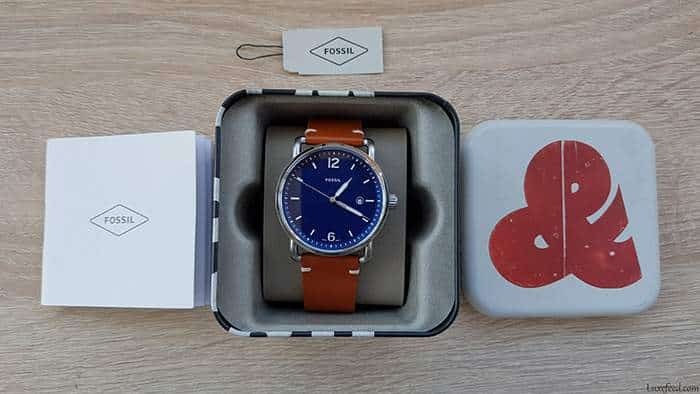 When it comes to presentation, some buyers have complained about the box’s playful and carefree look, but I think this was a very deliberate move from Fossil in order to prevent you from taking its cheaper products too seriously. Sure, this isn’t the cheapest watch on the market, but it’s still a sub $100 product, as it doesn’t cost more than $85 at the time of writing. Pro tip: you can find this watch on Amazon too. The box is made out of metal, and it has multiple designs in different colors. Mine came with a quirky red logo on the lid, and with a black and white pattern on the sides and bottom. Inside, the watch comes in a plastic wrap, and it envelops what feels like a metal wrist placeholder. 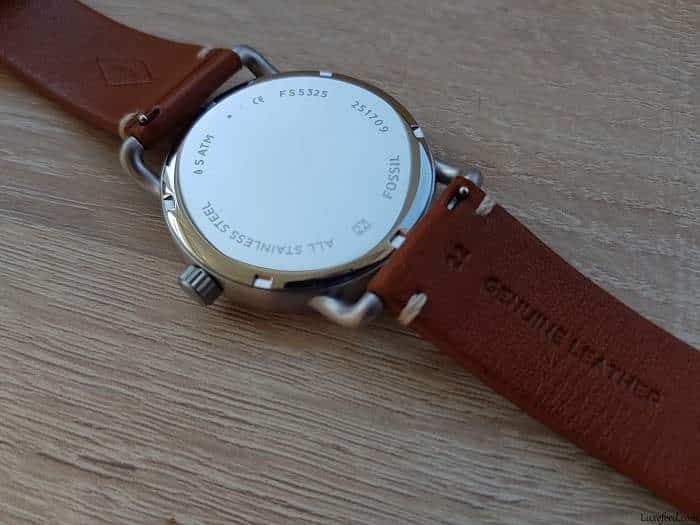 There should be a Fossil tag attached to the strap, and you’ll also receive a small instruction manual that contains all of your necessary documentation, including the warranty. Speaking of which, the FS5325 Commuter is backed by a 2-year limited warranty that covers defects in material or workmanship. 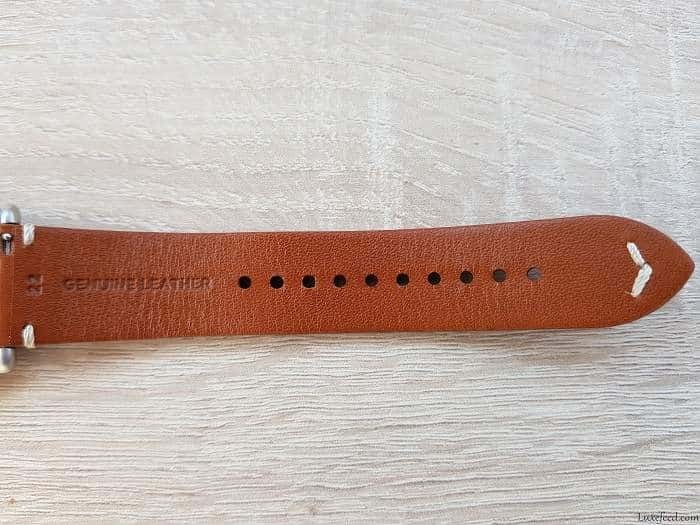 However, the Fossil website clearly states that they will not replace your strap if you stain it or fail to clean it properly. Final thoughts about Fossil The Commuter. 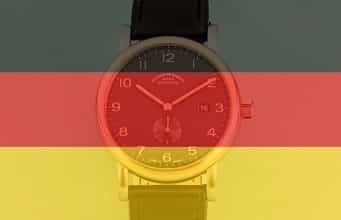 Fossil enjoys a good reputation worldwide, but since it’s not exclusively a watchmaking brand, some people might be hesitant to buy its timepieces. For everyday wear, the Commuter FS5325 seems to be a fine choice at the sub $100 price point, especially if you’re looking for a relatively stylish and modern watch. 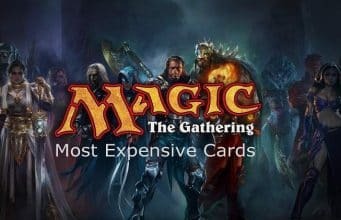 The excellent readability and blue dial are definitely great selling points, but the presentation could stand to see some improvements here and there. The fact that the watch was already working when I took it out of the box is also a slight inconvenient, but I can’t really blame Fossil for that, as this could have been related to the store I bought it from, import rules, and general regional issues. 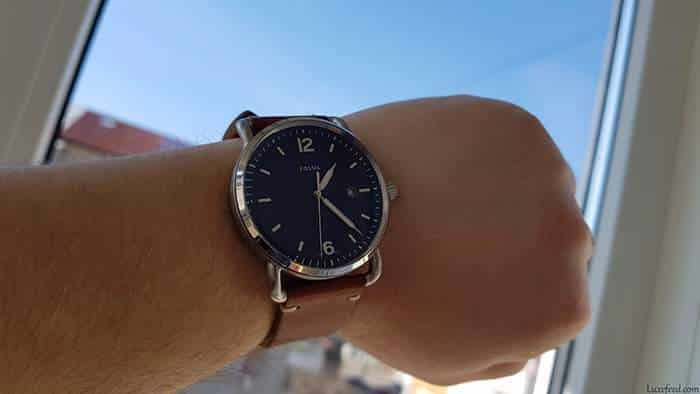 As it stands, I would definitely recommend The Commuter, especially since this particular Fossil watch also comes in a few other different models, including the FS5276 with a black dial and golden hands, as well as the FS5275, which has a beige dial, a brown strap, and black hands. You should also know that Fossil has its own custom engraving service that extends to these watches free of charge. 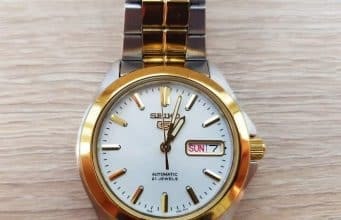 This could be a good idea if you’re looking to buy one of these timepieces as a gift, or if you just want to personalize for yourself. 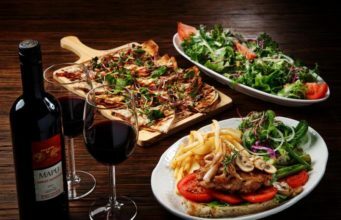 The service comprises three lines of text, and it allows you to choose one of five font options, namely Block, Roman, Contemporary, Script, and Scout.